Your resource for all things shoegaze and dream pop: EVENT SPOTLIGHT: DKFM and The Nothing Song present DreamGaze ATX | Night One. 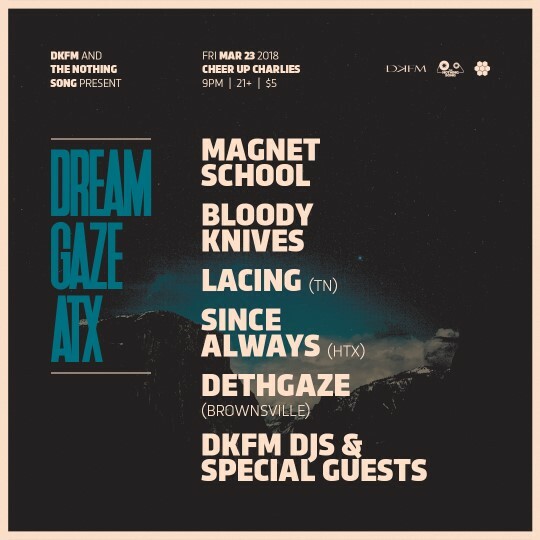 EVENT SPOTLIGHT: DKFM and The Nothing Song present DreamGaze ATX | Night One. DKFM Shoegaze Radio and The Nothing Song are proud to present DreamGaze ATX: two nights of the best in shoegaze and dream pop. DreamGaze ATX is DKFM’s first foray into the world of music festivals, and where better to celebrate the glories of reverb than Austin, the music capital of world? The timing of the festival, one week after Austin’s gargantuan South by Southwest festival, was a strategic choice. SXSW has grown increasingly corporate and expensive in recent years, and that atmosphere is not what shoegaze and dream pop are about. DreamGaze ATX is a festival that everyone can afford ($5 entry) and where all are welcome. No corporate backing needed -- love and enthusiasm fuel this fire. Mercedes Benz and Bud Light are not invited. Magnet School is an Austin-based quartet that formed in 2005. They’ve released two exceptional LPs, The Art of Telling the Truth and Tonight We Drink…Tomorrow We Battle the Evil at Hand, and both are in permanent rotation on DKFM. Yes, permanent. They’re that good. Bring your dancing shoes for this headliner – you won’t be disappointed. Austin-based trio Bloody Knives has been a DKFM and WTSH favorite since their debut LP, Burn It All Down, dropped in 2010. A string of top-notch albums and EPs followed, and now the band is set to release their fourth LP, White Light Black Moon, on April 5, 2018. Bloody Knives are known for their blistering, nihilistic noise and deafening live sets – this is a band you don’t want to miss. Lacing is a Tennessee-based 4-piece specializing in slow, sludgy noise pop of the most epic variety. We love these guys (read our past interview with Lacing here). After releasing the gorgeous Honey Glow EP in 2016, Lacing dropped their long-awaited debut LP, Bummer, at the end of last year (easily one of the best albums of 2017). With Bloody Knives and Lacing playing back to back on Night One, we recommend that you bring earplugs for your own safety. Since Always is a trio that hails from Houston, TX. Their shimmering guitar lines and emotional vocals make for an utterly captivating combination. After releasing the lovely Consequences EP in 2015, the group remained relatively quiet up until March 1, 2018, when they came charging out of the gate with a gorgeous new single entitled “We Still Know How to Dream”. They sound better than ever. Dethgaze is a 4-piece based out of Brownsville, TX. The group has been on DKFM’s radar since 2016, when they began releasing a string of jaw-droppingly excellent singles that continue to pop up on DKFM’s weekly charts to this day. Their most recent single, “H.R. ", came out in January, proving once again that they are expert songcrafters. Expect to be impressed by their live set. The Derevolutions Cover 60s Hit Agua de Beber. WTSH 112 is now streaming on Mixcloud! INTERVIEW: Phil Sutton of Pale Lights. Bandcamp Track of the Day: Burning House | Vague. INTERVIEW: Aaron Mills of Burning House. New Video + Album: Mint Field. WTSH 113 is now streaming on Mixcloud! WTSH 114 is now streaming on Mixcloud!